Check out the picture in the post below this one. 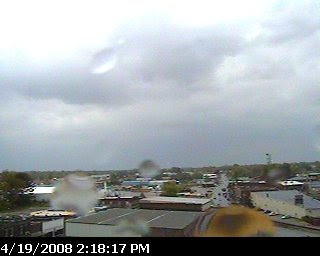 At 9 a.m., we were CLEAR...now, just past 2:18 pm, it's raining across most of Cookeville under a cloudy sky. The backside (or wraparound) moisture from the cold front that went through overnight is now here. This rainfall is confined mainly to the northern half of Middle Tennessee and is moving rapidly. This latest radar snapshot shows most of the heavier rainfall has moved east of my location (indicated by the + sign in the center of the page). Temperatures have dropped by 6° since the high of 65° around 12:30.